Moving out can be quite overwhelming. It is a never-ending chore, especially for renters who often faced this situation at the end of their lease. Apart from packing their stuff and settling the bills, a renter is required to hand over the apartment is pristine condition. Anything going amiss means they will lose their security deposit. It is stressful to take care of everything – right from packing to cleaning the house – single-handedly. And that’s where move out cleaning services help you! Move out cleaners do dusting and vacuuming, but they don’t remove all the nails, screws, hooks or other hardware. It is something you need to do. Before you hand over the keys to your landlord, remove the screws and nails, patch holes in the walls/ceilings and paint it to restore the walls/ceilings. If your landlord supplied you with any appliance like ovens, refrigerators, air conditioning system, and so on, make sure they are functioning properly before the cleaners start their task. Also, it is important to fix any appliance that is not working. The whole process of moving out can become chaotic most of the time. 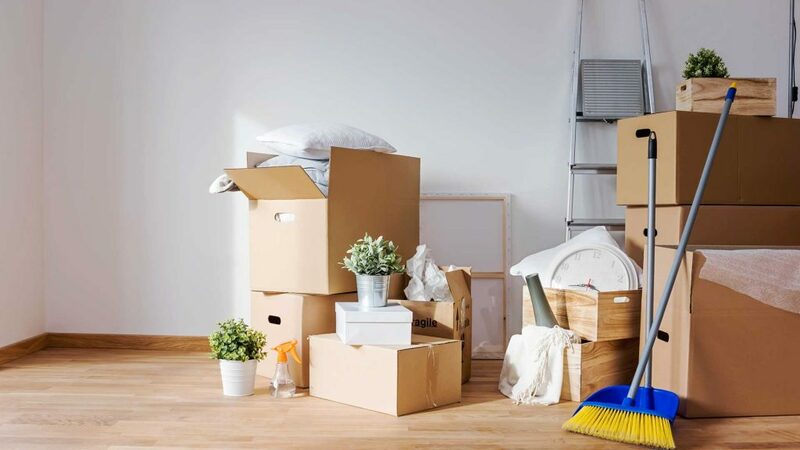 Therefore, to avoid misplacing or breaking any valuable items, it best to pack your essential and valuable things and move them into your new home. Do a quick check of all the tiles in your bathroom and kitchen. If you find any missing or loosened tile, make sure you get it fixed before calling in the cleaners. The cleaners wipe and mop the tiles, but they do not replace it or fix it. Moreover, it is important to note that cleaners only vacuum the carpets and cleans the flooring; they don’t fix it. Therefore, before calling the cleaners, make sure you have got the permanently damaged carpet or flooring replaced or repaired. Get rid of the unwanted items before you call the professionals. As you pack your stuff to move in a new home, you will realise many things are unwanted, and you don’t want to take them to the new place. You can either throw it or sell it to make extra money. We are moving into 2019 and want to leave all unwanted junk behind. Let start a Fresh and Clean 2019. Call us on (03) 90882056 for professional move out cleaning services. Do You Need An Urgent Local Cleaning Service Today? A clean home gives a delightful feeling! Local Cleaning Service is the basic necessity for everyone; you can’t stay at home freely and relax without having proper cleaning. As you know regular cleaning is important not only just because we need it but also for the proper cleaning of the home protects you from small bacteria. House Cleaning is quite difficult, and it is really very messy & tricky especially when if you don’t have too much time. Always read the label of any cleaning products because it might be dangerous for you, in case if you don’t have proper knowledge about the product. Difficulty in choosing the right products for cleaning. While cleaning dust can harm your skin and health. Bathroom & Toilet cleaning is very unhygienic involves 99.9% of germs. Your quality time will be wasted in the cleaning process. Sometimes it will take too much time. You may not able to reach every corner of your home. It’s a fantastic idea to hire any professional home cleaner, but you should be careful while choosing it. Most of the time unfortunately various incident happens, to avoid such kind of issues you should check the whole background of worker & company before appointing them. Are you also facing the same problem, do you need an urgent local cleaner? Don’t worry we at Local Cleaning Services in Melbourne are here to help you! We clean all rooms of your house along with a bathroom and toilets. It’s time to delegate all the tricky and dirty work to us. We are available all the time whenever you need any local cleaning services. Quality cleaning service is our specialty not only that we strictly check the background of our experts to avoid misshapen. We care for your wallet and that is the reason we never charge a high price for our cleaning services. Contact us @ 0390882056 for fabulous local home cleaning service. Commercial cleaning is a big requirement these days. As it has a significant role in converting your visitors into your customers and customers into repeat clients. But, getting your commercial premises cleaned can be a tedious task if you have not done it before. You can either end up messing it up or waste a lot of time without achieving desired results. It is better to use microfiber clothes over traditional dusters for dusting as these are more likely to absorb and grasp the dust, which leads to a better cleaning quality. All the air vents should be kept free from any obstruction or blockage as it can have a huge impact on the sanitation of the place. Water spills should be cleaned as and when required. This is because if you let the water gather at a place it will attract microbes and it will have a negative bearing on the hygiene of the place. Apply no smoking policy and restrict the smokers to a particular area so that the air quality of the surroundings does not get affected by it. Regularly dispose the garbage off in a proper way and make sure that it is being done as per a systematic plan that is laid off by the program instructions driven by the society members. The food policy should be prepared keeping the overall cleanliness of the place in mind. And people should only be allowed to dispose their left over food or used packets and disposables in an allotted place. Also, the refrigerators and food benches should be cleaned on a regular basis. These are some of the highly useful cleaning tricks that can extensively help you with commercial cleaning. You can always seek expert help in case you find it difficult to do yourself. If in case you need an urgent help with local cleaning service, contact local commercial cleaners in Melbourne for professional assistance. Hiring a housekeeper or regular house cleaning services is an amazing way to maintain the beauty of your house while saving both time and energy. If you are wondering what would be the cleaning services cost then this can be a difficult guess for you if you are not aware of the industry standards. To know how much you should be paying to the local cleaning services you should have an idea of the amount you pay to the maid or the housekeeping staff. Different house cleaning companies might charge different amounts based on the services provided by them. If you are a novice and have no idea how much a local cleaning services cost then we have done some fruitful analysis for you. Generally, housekeepers charge somewhere around $20 – $40 per hour of service rendered by them. If you talk to them based on the area they need to clean then it might be somewhere around $15 – $25 per square feet. Generally home cleaning company takes approximately 2-3 hours cleaning your house. So if we go according to that you will have to pay somewhere around $40 – $80 every time you hire cleaning services in melbourne. Cleaning services cost may also vary depending on the number of rooms and bathrooms in your house or flat. If there are more number of bathrooms then they might charge extra as these spaces consume more time than others. Apart from the above-mentioned criteria, the cleaning services cost also depend on some other factors such as the skill set of the housekeeping staff hired by you, the work experience of the house cleaner who would be coming to your place for cleaning, etc. Also, if you are asking them to get the cleaning supplies then you might be charged extra. Once you know the above factors, you should hire the cleaning services based on rational thinking and total budget. 7 Major Mistakes You Make Cleaning? All of us make use of the cleaning equipment to clean homes. But rarely do people follow the right cleaning techniques. Local cleaning services in Melbourne provide the best assistance in letting you know the right use of the cleaning equipment. In this article, we’ll list seven major mistakes people generally make while cleaning. Using dish soap on cutting boards : Chopping boards are generally made of wood. If you are using regular dish soap for washing them then it is doing great harm to the wooden material. Neglecting the most touched points : Handles, door knobs, faucets, etc. are those points which are touched by us the most. But we generally tend to neglect cleaning them. So as you are cleaning the other parts make sure you wipe them too. Don’t get lazy with the coffee maker : You should clean each and every part of the coffee maker and not just the pot after disassembling it. Otherwise it will harm the machine in long run. Spraying the cleaner directly on the furniture : If you are spraying the cleaning agent directly on the furniture surface then your cleaning technique is wrong. You should spray it on the wipe or cloth and then clean. Using the same rag for every purpose : If you are using the same rag everywhere then you might be wrong. You should be changing the rag use for cleaning every day else you’ll end up spreading more germs. Do not use a feather duster : You may fancy getting a feather duster to clean homes. But trust us it is not a very good option for dusting. Rather you’ll end up spreading more dust from one surface to another. You should be using a microfiber cloth. Dust the windows : Before washing the windows you need to dust them. Many people just spray water without wiping off the dust. Cleaning the house is an essential part of every person’s life. You cannot do away with it at any cost. How much you try you cannot escape the cleaning routine be it every day, every week, or every month. If you do not have sufficient time then you should find local cleaning company which will help you with the weekly cleaning routine. As per the experts of a local cleaning company these are the 10 things you need to clean every week in your home. Laundry – It features first in every week’s cleaning tasks. You should not delay washing your clothes accumulated over the past week. Bathroom Surfaces – Bathroom is the place where most of the germs can reproduce and multiply in number. You should make it a habit to clean the bathroom surfaces like the tiles, mirror, etc. once every week with a disinfectant wipe or cleaner. Carpets and Rugs – You might not realize but carpets collect dust every minute. With time the dust particles settle in. Therefore, you should make it a point to clean the carpets and rugs using a vacuum cleaner to remove the hidden dust. Furniture – it is very much possible that you do not get time to dust the furniture daily therefore it should be included in your weekly cleaning routine. Bed Sheets – It is important to get rid of the germs. Kitchen Appliances – Fridge and microwave are the main appliances that need cleaning. Bath Tub and Shower – it will prevent unnecessary blockages in the shower and keep the tub clean and shiny. Toilet Seat – if not daily it should surely be cleaned once a week. Mirrors – Use a cleaning agent to clean mirrors weekly. Light Fixtures – Cleaning them weekly will reduce your headache later on. 5 Household Cleaners You Can Make Yourself? Every time when you run out of the cleaning agents in your home, it can be quite cumbersome for you to carry on with the cleaning task. You should not be entirely dependent on the artificial cleaners which you get in the market as their absence can put a hault to your work and make the house look dirty. Even the local cleaners in Melbourne suggest their customers to try the homemade cleaners for daily cleaning. In this article we’ll discuss some such effective household cleaners suggested by the local cleaners in Melbourne that can be made easily at home. Glass Cleaner : You need to mix half cup white or cedar vinegar along with one fourth cup alcohol. Now add 2 cups of water to the mixture and fill this mixture in the spray bottle. This mixture works great for glasses and windows. One thing that you should keep in mind is that you should not use this mix in scorching sun as it dries very quickly. Heavy Duty Scrub : You need to dip a half sliced lemon into the borax powder and then rub it on to the dirty surface. After proper scrubbing rinse off the surface. This technique works best for the rusted porcelain and other enamel products. You should not be using this on marble and granite. Grease Cleaner : Make a mixture of Gudsy ammonia and water and use a sponge to mop the surface with it. Rinse off with clean water. It is commonly used for cleaning oven hoods and grills. All Purpose Cleaner : Take four tablespoons of baking soda and mix it with warm water. Now you can use this solution to clean all kinds of surface like the kitchen cooktop, electric appliances, refrigerators, etc. Cloth Stain Remover : For badly stained clothes you need some tough stain removers. Use chlorine bleach with warm water and detergent to remove the tough stains. A local cleaning company, Clean Stride, is cleaning homes for women? How Much Does a Local Cleaning Services Cost? Find Your Local Cleaner in Melbourne Area? How To Clean Your Mattress in Melbourne? Mattresses receive most of the dirt, dust, and other foreign particles as they are used the most by the people. You might be using linens and other forms of mattress covers, but still it is impossible to prevent the mattress from getting dirty or soiled with stains. You can choose to clean the mattress yourself or else if there is lack of time then you should prefer hiring the cleaning services provided by the cleaning company that have professional staff to take care of all your needs. Vacuum: You should first remove the mattress cover and then use the vacuum cleaner to to get rid of all kinds of visible and invisible dirt and dust particles. Vacuum cleaner is also good to use when you haven’t cleaned the mattress for a long time as it will remove even the minutest dust particle from your mattress. Even the cleaning services make use of vacuum cleaners. Spot Cleaning: Depending on the kind of stain you are required to choose the cleaning agent for getting a clean shining mattress. If the stains are from regular body-based fluids like sweat, urine, etc. then they must not be new and fresh. Such stains require strong cleaning agents. You can also try some easy home remedies for cleaning the mattresses. Deodorize: You can also try deodorizing the mattress using baking soda by sprinkling the powder on the mattress. It will absorb excess liquid from the mattresses and make you feel fresh and nice. Air it out: If you have access to sunlight, then the best way to clean the mattresses is to hang them out in the air for sufficient amount of time. Sunlight and UV light are the best way to free the mattresses from unwanted odor. Are you tired of cleaning your house all the time? Do not have time to do all the cleaning yourself? You can avail our professional local cleaning services in Melbourne to ensure spotlessly clean homes at the most affordable price range. We offer high-end cleaning services in Melbourne as we have the best team of highly skilled and experienced local cleaners who are well-versed with cleaning strategies and tools to give you an ultimate feel. Our cleaning services cost is highly affordable and include all the major cleaning areas in the most economical range. We always tend to wrap up our highly affordable cleaning services with high-quality performance by our experienced cleaners in Melbourne. We offer different cleaning packages on the basis of the frequency of your cleaning requirements. On the basis of the cleaning package chosen by you, we will be offering our reasonable cleaning services to you in the best possible manner. Similarly, you can check out for monthly, fortnightly, and one-off house cleaning packages provided on our local cleaning services in Melbourne official website. We offer the best-in-class local cleaning services in Melbourne at the most affordable range. Hire our experienced local cleaners now to get your home spotlessly cleaned in minutes. Reach out to us now! Do you have a hectic life schedule? Finding it hard to cope with household chores and professional life at the same time? For those who have a busy work schedule, doing normal household chores like cleaning homes and so more can be a difficult task. In such cases, you can hire a local cleaner in Melbourne area to ensure all your household cleaning with much ease. By availing the professional local cleaning services in Melbourne from us, you can be at peace of mind when it comes to cleaning your home from tip to toe. Reliability of Services : With us, you can rely completely on our professional local cleaning services. Our local cleaners are well-skilled and experienced in the given field and thus, ensure great cleaning services in the best possible manner. Professional Cleaning Services : When you hire our cleaning services in Melbourne, you can be assured of the professional of services being delivered to you. We have immense experience in the given field and pay great attention to detail while working with each individual client. Highly Affordable : The best thing about local cleaning services in Melbourne area from us is that we follow a highly reasonable pricing structure. We understand your cleaning concerns and thus, ensure the cleaning services at highly affordable rates. Round-the-Clock Accessibility : We are accessible for giving out professional local cleaning services at most of the times. We are available throughout the week from 7 am to 7 pm every day except for Saturday & Sunday. On the weekends, we are available from 9 am to 4 pm at your service.